AHS founder and helicopter pioneer widely known as "Mr. Helicopter, " Ralph P. Alex began his 36 year association with Sikorsky Aircraft in 1941, where he worked with lgor I. Sikorsky and a dedicated group of visionaries during the early beginnings of the industry. 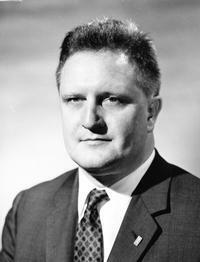 While at Sikorsky, he held senior positions in engineering and marketing until his retirement in 1977. For much of the past 20 years, he consulted on modifications to fixed and rotary wing aircraft as an FAA designated engineering representative and as an expert on advanced materials and manufacturing technology. Mr. Alex was the project officer on the first Army helicopter — the XR-4 — which he personally delivered on May 17, 1942 to Wright Field in Dayton, Ohio. He designed the XR-6, the first streamlined helicopter, considered by many to be the forerunner to the modern helicopter. He also participated in the design of the first turbine engine powered helico pter. During the 19SOs and 1960s, he worked closely with the U. S. Army in designing and pioneering helicopter armament. Demonstrations of the potential for arming Army helicopters during that period led to the development of modern attack helicopters. One of the founders of the American Helicopter Society, Ralph Alex served as its first and fifteenth president, was elected an Honorary Fellow of the Society in 1964. In 1977, he was — awarded the Society's highest honor — the Dr. Alexander Klemin Award for notable achievement in the advancement of rotary wing aeronautics. " For his contributions to the international development of the helicopter, the USSR Aero Club presented him with the Yuri Gagarin Award. He was a Fellow of the Society of Automotive Engineers (SAE) and president of the Helicopter Commission of the Fédération Aéronautique Internationale (FAI) for nearly 30 years and Chief Juror at the lirst, second, third and fourth World Helicopter Championships. In 1986, the FAI presented him with a gold medal in recognition of his achievements. Most recently, in 1994 he received Helicopter Association International's Lawrence D. Bell Award for "outstanding service to the civil helicopter industry over a period of time. "